OLD PARKED CARS. 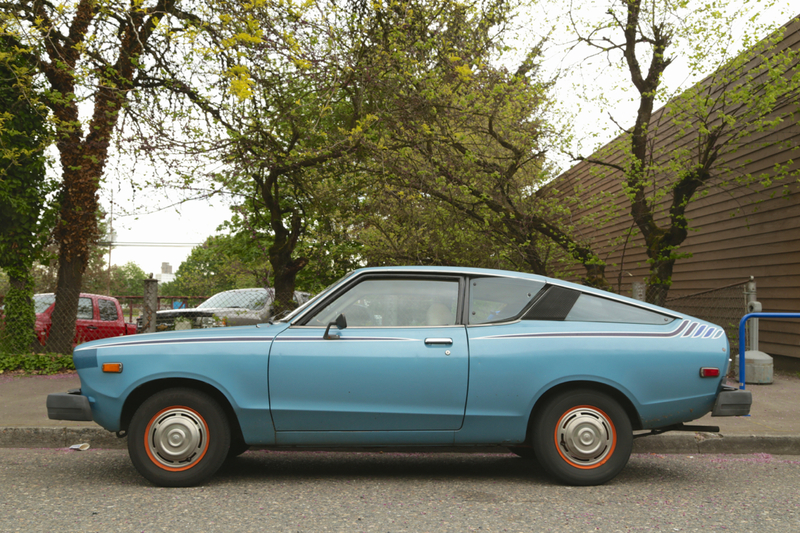 : 1977 Datsun B210 fastback. than anything else there. Don should like this. They kept it simple and stupid. Captaingizmo: "Rhodan meets rocket boy"
These cars present a philosophical contradiction to me: On the one hand, I hate tinny little death-trap cars...'specially when they're FUGLY; On the other hand, these cars were so mechanically simple and straight-forward, they were like the ultimate in economical transportation. Cheap to drive- easily getting 35MPG; cheap to maintain (even a mechanical doofus could pretty much fix anything on one of these...everything was easily accessible; and virtually no electronics or Rube Goldberg contraptions as alternates! )- and if treated with even lax care, hardly anything would ever go wrong; the drive-train was light and minimalist...but made of real steel; and quite bulletproof. A kindly old-man whom I knew used to drive one, and I rode with him in it several times- I remember marveling at the economy....but just being utterly repulsed at the idea of having to actually drive one! you an honest 40 MPG all day long. Within the first year or so, that car started rusting away. Datsun, may you rust in peace. I had a '76 or '77 B210 wagon in around 1983. It was red with a white interior, a 4 speed manual. I used to drive the heck out of it and blew it up on the QEW in Toronto. we might see a few more of these today. Love the pinstripes and hubcap combo. What a survivor! Wow I remember seeing these cars in the early 80's. I think I remember seeing a lot of them in the color yellow & blue. I think there was one I usually saw black pint stripes known as the (Honey Bee) The old commercial jingle---" Datsun we are driven"
Hey guys, I'd be interested to know how much you've tried our search function...because we caught a Honey Bee back in 2011! It was also selected as a Best of 2011. Bridgetown blog beat you to it. 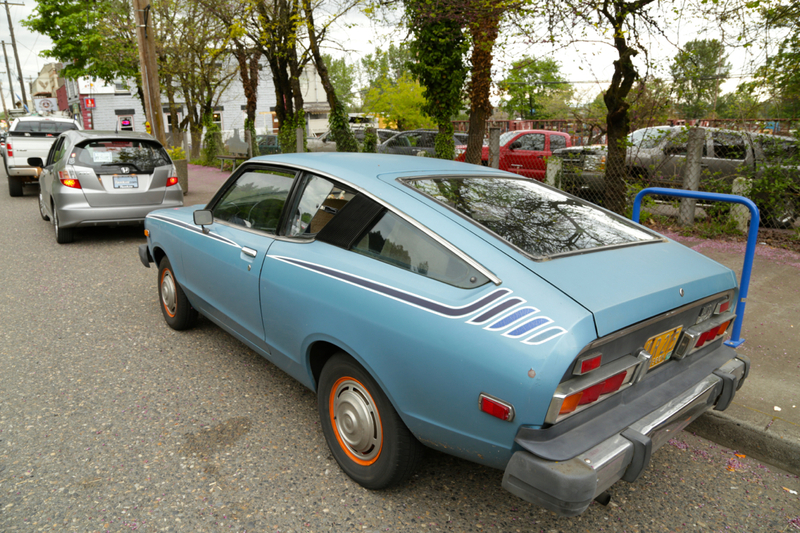 Nice B210, I've never seen the fastback version before. YAY!!! My beloved sunny boy has finally made 'Old Parked Cars'. I am so excited! Thanks for the compliments on this glorious machine. 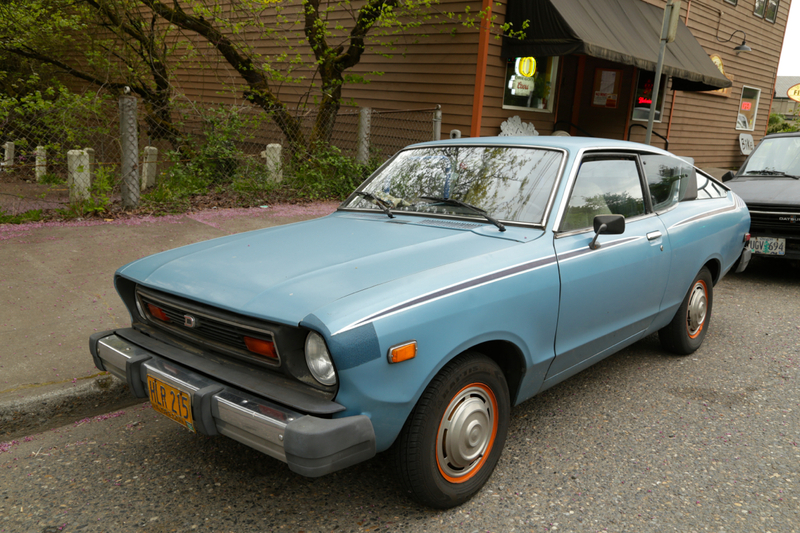 My loving boyfriend painted the wheels my favorite orange to compliment the blue, and we kept the tasty 510 hubcaps that were on him at purchase. I am saving my pennies for some slotted mags someday, and have plans to do a subtle rake / bigs & littles in 2015. Despite his dusty appearance in this photo, I try to take great care of the car and really really enjoy driving him, too. It's always great to get a random thumbs-up or a stunned and gaping open mouth by folks stunned to see this survivor. He is a 5 speed dog leg, if anyone wondered, and it still gets fantastic gas mileage. Thanks again for taking the photo and all the nice comments. Look for me at the Canby meet this summer and say hello.